By using Lendify you can use the banks model and lend your money to credit worthy borrowers. We cut the middlemen and create better conditions for both borrowers and investors. Everybody wins - besides the bank. Choose your time horizon, how much you want to invest, if you want to make monthly deposits and if you wish to reinvest the monthly payments that you receive from the borrowers. Of which @interest is earned interest, @principal invested today and @monthly invested each month for @period with an annual interest rate of @rate. * The amount is shown after expected credit loss and fees, but before taxes. The expected return varies depending on numerous factors, such as the borrowers credit scoring and the loans duration and is based on the average interest rate during the last 90 days. Using one of our Autoinvest accounts your invested capital will be divided into a basket of loans in order to achieve a good diversification. 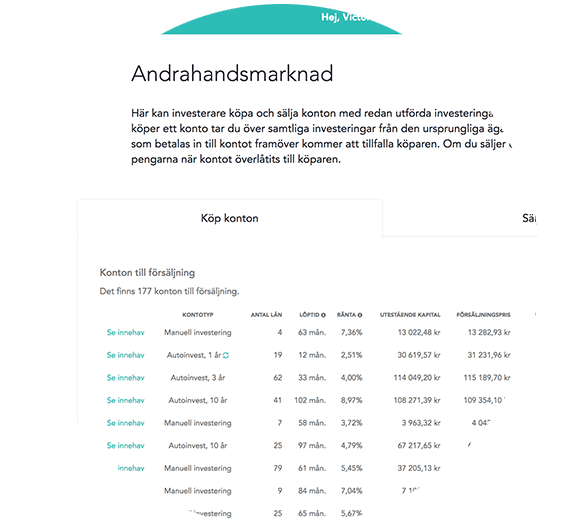 Choose between Autoinvest Kort and Autoinvest Lång, which determines the maximum duration of the loans that are part of the account. Decide if you want to reinvest your monthly payments, the rest is managed automatically. 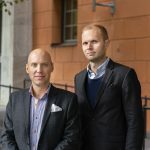 Read more about Autoinvest (in Swedish). All loans are annuity loans, which means that the are payed back with a fixed amount each month, containing both amortization and interest. You can either choose to reinvest your monthly payments or withdraw them to your bank account. This gives you a monthly cash flow. If you use Autoinvest you can choose to automatically reinvest your down-payments in order to achieve the compounding effect. You can turn off this function whenever you want. A solid credit assessment is the cornerstone in the operations of Lendify. We only allow credit worthy private individuals to borrow money through our platform. In the picture to the left our average borrower is depicted. We assess our borrowers economic situation thoroughly. We retrieve information from UC where we receive information about income, and we make cost calculations for each individual loan applicant and the applicants household. If the applicant hold remarks, they will be denied a loan. The purpose of the credit model is to protect our investors from credit losses and our borrowers from too much debt. Due to our selective credit process, around ten percent of the loan applications we receive are approved. Loans to credit worthy private individual is an established asset with a long track record. What is new about it is its availability through Lendify. 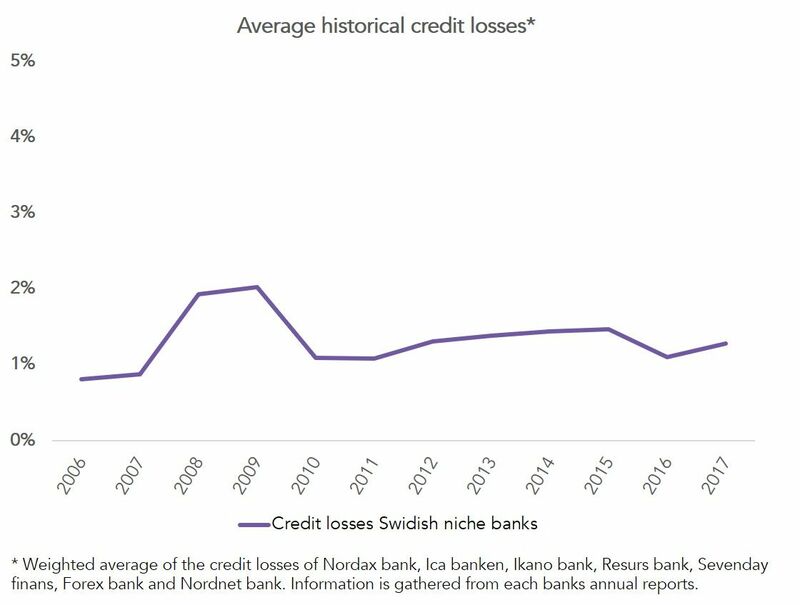 History from Swedish niche banks shows that the credit losses for these types of loans have been low and on even levels. During the financial crisis in 2008 the credit losses increased slightly from around one percent to two percent. The high interest rate on this type of loans creates a blunting effect in the case where credit losses would increase. Referring to the levels of the credit losses in 2016, the credit losses would have to increase six times before invested capital would be affected. 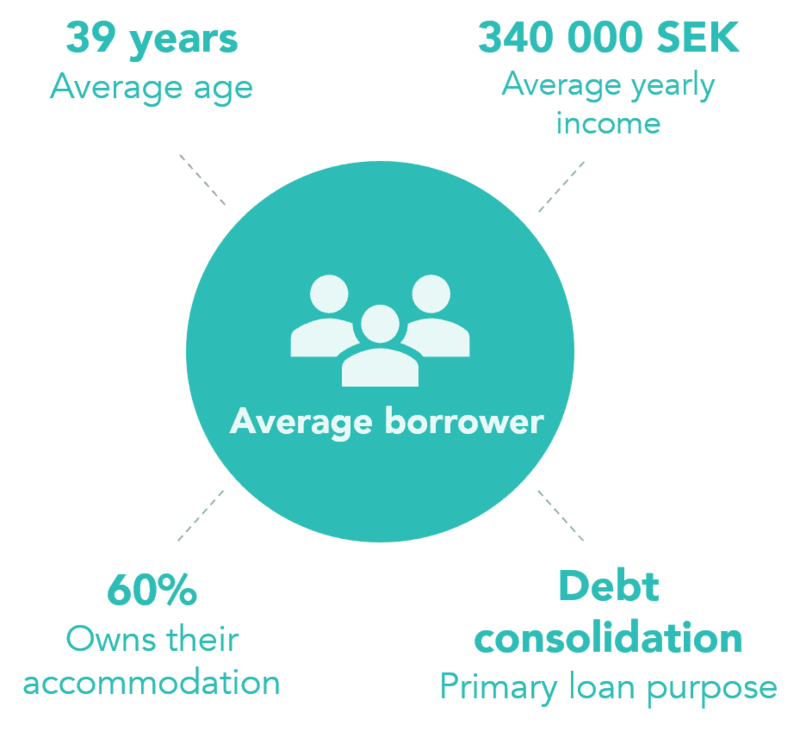 The willingness to pay your loans is high in sweden. Despite this, the borrowers could be late with their repayments. We remind all borrowers that are due with their payments via post, text messages and phone calls. If the borrowers haven’t payed within 120 days, the claim will be transferred to debt collection. Read more about our collection process (in Swedish). Asset liquidity is created through the secondary market and investors on the platform can buy and sell existing accounts between each other. If you would need to withdraw your money before the maturity of your loans, there is a possibility to sell your account on the secondary market. On the secondary market all the trades are made between investors on the platform and no fees are included for any part of the trades. As an investor you can buy an existing account that is available to buy on the platform. Keep in mind to control that the account you consider buying fits along with your investment strategy in terms of loan maturity and such. When you publish an account on the secondary market, you choose the price you want to sell the account for. You choose the price in relation to the total value of the loans that are outstanding, which is the sum of all future amortizations to the account. Divide your invested capital into a basket of loans in order to get a good diversification. Extra protection for investors through an agreement with Lowell (former Lindorff). Our organization is based upon transparency. With a purpose to cover deposited capital on Autoinvest accounts in case of credit losses. Lendify Rewards is a unique loyalty programme, designed for our borrowers. Our ambition is to be a positive force that contributes to improve the economy for Swedish households. Lendify Rewards is a loyalty programme using a point system, based on gamification. We have a digital economy school (in Swedish) together with the education platform “Börshajen”. Lendify Rewards and the economy school consist of different levels connected to clear incentives and the economy school provides the concrete tools for the borrowers to take control over their private economy. When a borrower pays their loan in accordance to the payment plan, they can receive reduced interest rate. Through improved knowledge and loyalty, our already low credit losses could decrease further. 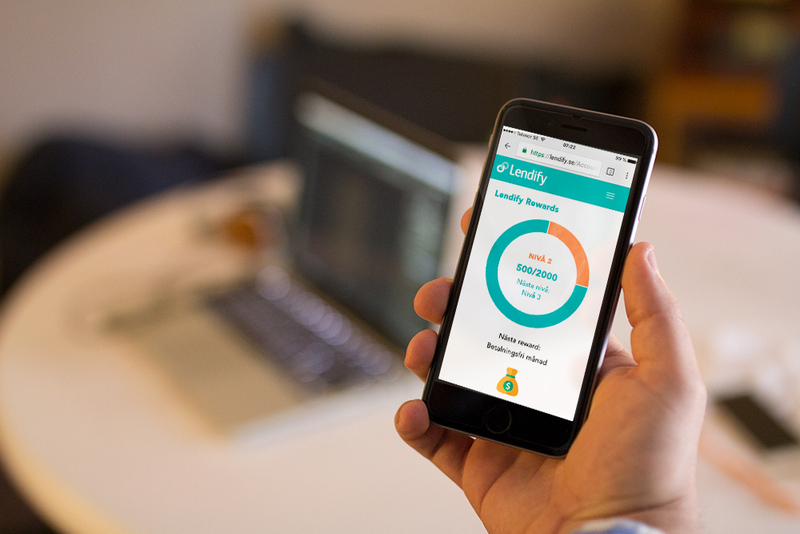 "Lendify fills an empty space as an form of investment, with an asset class that before has been missing in most investerment portfolios." Sign up with Lendify. We challenge the banks and create a more effective and transparent market for loans. Leave your e-mail with us and we'll contact you with more information. Something went wrong. Check your e-mail and try again.